Shopping App Development : Make a Shopping App Like Wish: How Much will it Cost? Shopping App Development : Wants to Make Money Fast Through a Shopping App Like Wish? Create Online Shopping App, Know, How Much will it Cost? In the coming years, e-commerce is expected to grow to new heights. People are going crazy towards using mobiles. The trend of smartphones has increased from the time it got the companionship of fast mobile applications. People are experiencing the smoothness and ease of transactions. Online shopping makes it easier and more fun for people to shop without moving out of the comfort of their homes and without facing the crazy crowds in the marketplace. 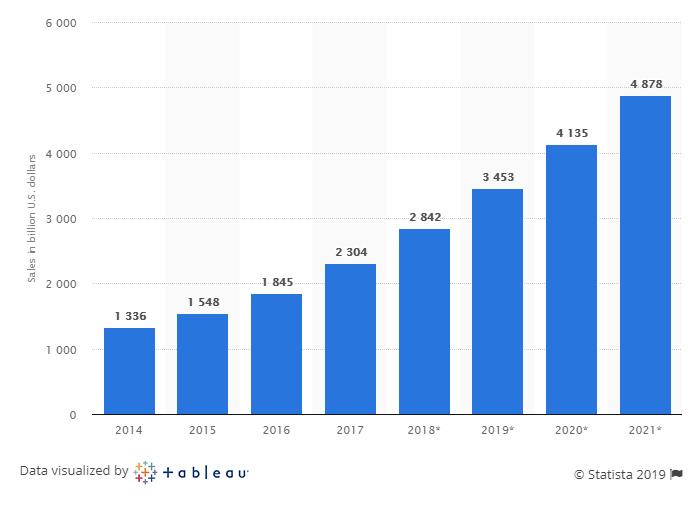 The data of retail e-commerce sales worldwide from the year 2014 to 2021 is depicted by the following bar graph. There were a few limitations in the mobile web browsers, so mobile e-commerce applications were considered to be a way for a personalized approach for each user. According to Statista, Mobile e-commerce market in the USA will have reached 170 million by 2019. Despite a variety of platforms available over the internet like eBay, Amazon, Alibaba etc, Wish is becoming more and more popular among the e-commerce audience. Peter Szulczewski owns 18% of this e-commerce site, which connects shoppers with merchants. Know, What is Wish Application and how does it work? To Create Online Shopping App. The developers wanted to build something which would build their own place in the market and also gain some popularity for them in the competitive marketplace. They needed an idea which was absolutely different from what actually existed in the market. The Wish shopping site first allowed its customers to create their shopping list. After that, they informed the trade business representatives of the number of potential clients who wanted to purchase their items. The Wish store offers Chinese items but it also allows people from other countries to use the mobile shopping application for the business purpose. This app has a simple and easy to use interface. It looks like a board with home goods from different categories. Let’s take a closer look at what this application really is. It’s nothing out of the box when it comes to the concept but yes, they have made the user interface much simpler. The Wish application connects customers and sellers worldwide. They have more than 100 million active customers and more than 100000 merchants. The app has more than 300 million app users and is available on google play and app store. According to a study, people spend a long time on Wish than any other shopping site. They have billions of real time users today. Mobile shopping app depends on impulsive buyers other than it’s offers and bonuses. Also, there are a lot of items which are unavailable anywhere else which makes it more in-demand. It has concentrated a lot on mobile platforms. The app is cross-platform and multi-app approach has led it to be more accessible. Also, the developers have created 6 projects related to the application. The app allows a customer to buy stuff related to home decor, beauty products, products related to fashion, clothes, and fashion shoes and makes the experience similar to a shopping mall. The app doesn’t provide delivery or guarantee the quality of goods or the sellers that use the app. The sellers are responsible for all the services regarding the items. It charges 15% on each successful deal. This app had 32.5 million downloads in the USA alone, which is much more than other e-commerce clients. It has managed to increase the revenue by 28% just by its e-commerce presence. This app lets the buyers earn rewards on every purchase as the buyer can earn and redeem points. The app enables faster shipping and delivery of goods. There are millions of merchants available to compare and buy goods. The customer service and customer support is available 24/7 with the best people to help out. How to create an app like Wish? If the progress of Wish has developed a curiosity in your mind to have your own Wish-like marketplace, here is what you can do. First things first, start with defining the functionality set. Starting with an MVP version would be the best choice. This approach would allow you to test your business idea and check the feasibility with less investment. This application started with the basic functionality of creating a wishlist for its users. The other app features of the app were added later on. Registration is the main feature of any app that a customer looks for. You need to make sure that it is kept simple and easily understandable by every age group. This is a common feature of any e-commerce website. When you make the signup easier, you have increased the number of people accessing your application. The search option is most important and you need to make it easily spottable on the page. You need to make the search feature simple so that each user is able to search their required items at a click of a button. Similar to the wish shopping, you can also have a wishlist for your users to know what they really desire. This will help you increase your sales. The users should be able to get information regarding each offer at the earliest. Push notification makes the users aware of the existing and coming up offers. Like every other software application, payment integration is essential in an e-commerce application too. Your customers should enjoy hassle-free payment options either before or after the delivery of an item. They should get a choice of paying using a credit card or any mobile wallet. I hope, this gives you a clear idea of what your e-ecommerce mobile app should be like in order to thrive in the highly competitive market. If you have something else in your mind, you could give us a call or get in touch with us through our Contact Form. At Coruscate, We are 5+ year old ecommerce apps development and mobile apps development company. We provide free consultation for mobile application development. Our skilled developers can help you build e-commerce mobile app which will give new wings to your business.